Growing up in the ARPAnet days, I only had access to the books in the local library and small B. Dalton’s. 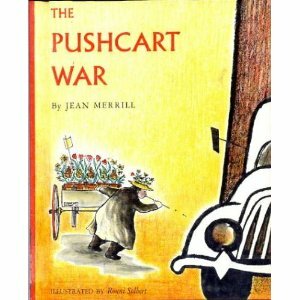 I believe I found Merrill’s economics tutorial The Toothpaste Millionaire at a book fair and liked it enough to track down her magnum opus The Pushcart War in the library. The book has more or less stayed in print, though, and it certainly sells better than most of the books I talk about here. The subject of the book is, for the most part, guerilla warfare and insurgency. Three big trucking firms seek to have pushcarts banned from New York to clear the streets for more trucks, making way for (it is later revealed) banning cars and even small trucks as well. They work with the corrupt mayor, but the pushcart owners wage war by shooting tacks into tires, causing the trucks to break down and annoy the public/civilians, turning them against the trucks. This seems like a pretty blatant allegory for Vietnam in particular, since the failure of the US’s huge forces against asymmetrical guerrilla warfare resulted from absurd civilian deaths causing the Vietnamese to increasingly side with the Vietcong. But the book was published in 1964. Vietnam did not have the overwhelming presence in American life then that it would have a few years later, but I get the sense Merrill was pretty well-informed and politically interested. Still, the book could also be drawing from French experiences in Algeria, or perhaps France’s own futile war in Vietnam against the Viet Minh. There are also echoes of the civil rights movement in the nonviolent protests that occur toward the end of the book, but honestly, they are much weaker, as there is no analogue for segregation or discrimination. And the nonviolent protest is less entertaining than the tales of taking out trucks with pea-shooters. I remember being disappointed as a kid that the guerrilla war ended (though it is picked up briefly by kids imitating the cool guerrillas) in favor of more abstract dealings. “The Three” were originally known as “The Big Three,” but this caused some confusion as the leaders of three important nations of the time were also called The Big Three, and after a city newspaper ran a headline announcing BIG THREE CARVE UP CHINA (over a story about Mammoth, LEMA, and Tiger Trucking buying out the China Carting & Storage Co.), there was some international trouble in the course of which Moscow was bombed by an Indo-Chinese pilot. After that the city papers referred to the three big trucking firms simply as The Three. Capitalists/imperialists that they are, “The Three” pretty much own New York Mayor Emmett Cudd, at least until public opinion turns so decisively against the trucks that the mayor drops them without a second thought. Cudd’s schemes are somewhat limited by the unnamed Police Commissioner (all police officials go unnamed, in fact), who enforces law and order but does refuse to go on witch hunts. He comes off more affably than the others despite going unnamed, and I have to wonder why Merrill chose to leave him anonymous. It almost seems to enforce a conservative dictum that entrenched civil servants will remain less corrupt than elected officials. Still, the message is pretty clearly “hearts and minds.” Ultimately, popular opinion rules, and there’s no way to get traction if the public hates you. Ah, if only life were so simple. Still, this is one of the best social realist kid books ever written, and far more fun than Chernyshevsky’s What is to Be Done? One loose end. While Moe and Tiger give up and Louie Livergreen goes into hiding and (it is hinted) is killed, Cudd gets reelected mayor without suffering any ill consequences. This bugged me as a kid. It still bugs me now.